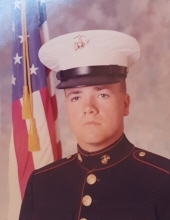 Danny George Dugger age 65 of New Castle passed away on March 25,2019 after a sudden illness at St. Vincent hospital in Indianapolis surrounded by his family. He was born on July 12, 1953 in New Castle a son of the late George and Betty Martin Dugger. He was a graduate of New Castle Chrysler High School class of 1971. He was a veteran of the United States Marine Corp. He retired from Dana corporation after 28 years of service. He was an avid Harley rider and enjoy the outdoors spending time with his family watching High School Basketball especially the New Castle Trojans. He also enjoyed NASCAR, professional wrestling, and the Indianapolis Colts. But most of all he loved his family and friends by whom he will be greatly missed. Left to cherish his loving memory include his wife Carol Overton Dugger of New Castle, his daughter Chelsea Dugger of Indianapolis , two sisters Teresa Jones of New Castle and Sandy Dugger of Spiceland, several nieces and nephews and many many friends. Family and friends may call from 5 pm until 9 pm on Thursday March 28,2019 at Macer Hall Funeral Home and Cremation Service. Funeral service will be held at 11 am on Friday March 29, 2019 at Macer Hall Funeral Home and Cremation Service with Rev Denny Neal officiating. Burial will be in South Mound Cemetery where military rite will be conducted by the United States Marine Corp and the American Legion and VFW of New Castle. Macer Hall funeral directors are honored to serve the family of Danny Dugger. To send flowers or a remembrance gift to the family of Danny George Dugger, please visit our Tribute Store. "Email Address" would like to share the life celebration of Danny George Dugger. Click on the "link" to go to share a favorite memory or leave a condolence message for the family.